In the 20-sim Simulator, out of an existing (non-linear) model a symbolic linear-system can be derived by means of linearization. This means that the relevant model parameters are preserved in the Linear System. As you can see, the some elements of the A, B, C and D matrix are related to the spring constant and masses of the original model. 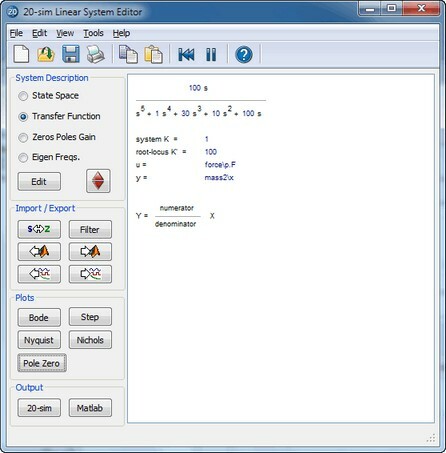 A symbolic linear system can be edited by changing the original model parameters. Click the Edit Parameters button and a Parameters Editor pops-up. Change the desired parameters, close the Parameters Editor and the linear system will updated. When the parameters have been changed in the Linear System Editor you can update the parameters in the Simulator by clicking the Update to Simulator button . Click the Update from Simulator button to do it the other way. You can export a symbolic Linear System to Matlab, with preservation of the parameter relations, by clicking the Matlab button or selecting Export to Matlab command from the File menu. This will generate an m-file that you can use in Matlab.